Job losses caused by the Great Recession refers to jobs that have been lost worldwide within people since the start of the Great Recession. In the US, job losses have been going on since December 2007, and it accelerated drastically starting in September 2008 following the bankruptcy of Lehman Brothers. By February 2010, the American economy was reported to be more shaky than the economy of Canada. Many service industries (particularly in countries that either have the same unemployment rate as the United States or greater) have reported dropping their prices in order to maximize profit margins (looking to make use of any price elasticity of demand in their market segments). This is an era in which employment is becoming unstable, and in which being either underemployed or unemployed is a common part of life for many people. Note: Job losses in June and July 2010 are largely attributed to US census worker jobs lost. Private sector jobs have increased during those months. Since the start of the recession, 8.8 million jobs have been lost, according to the Bureau of Labor Statistics. In the U.S., jobs paying between $14 and $21 per hour made up about 60% those lost during the recession, but such mid-wage jobs have comprised only about 27% of jobs gained during the recovery through mid-2012. In contrast, lower-paying jobs constituted about 58% of the jobs regained. Drastic job loss in Canada started later than in the US. Some months in 2008 had job growth, such as September, while others such as July had losses. Due to the collapse of the American car industry at the same time as a strong Canadian dollar achieved parity +10% against a poorly-performing US dollar, the cross-border manufacturing industry has been disproportionately affected throughout. While job creation has increased in the past three months, most Canadians still complain about people getting laid off from work. However, a growing amount of these layoffs are considered for seasonal purposes and has little or no relation to the recession. Excluding Stelco employees, most laid off workers have six months to acquire a job while collecting [unemployment benefits|unemployment insurance]]. After that, they must go on welfare and continue their job search from there. The employment rate has been stabilized between 8.0% and 11.0% for the past two years; signifying the economic strength of Canada's financial institutions compared to its counterparts in the United States. Many job places in Canada (i.e., grocery stores and restaurants) have opted to reduce hours rather than lay off staff. This unemployment of job protection is especially in industries that are needed to keep the economy from going into a depression. While the automotive sector is slowly recalling workers back to work, grocery stores and restaurants have slashed hours in the face of the global recession. The unemployment rate for October rose slightly due to population growth and other factors leading to 35,000 people looking for work, even though 24,500 jobs were created. In general, throughout the subdued economic growth caused by the recession in the rest of the world, Australian employers have elected to cut working hours rather than fire employees, in recognition of the skill shortage caused by the resources boom. In September 2007, approximately a year before the recession began, unemployment stood at 1,649,000.By the end of 2008, that figure had risen to 1,860,000 - an increase of 211,000 and nearly 13%.By March 2009, unemployment had increased to more than 2,000,000 - the highest level the nation had seen for more than 12 years.It reached 2,261,000 by June that year,and by April 2010 had exceeded 2,500,000 for the first time in 16 years. This theme also extends to compensation reduction or growth freezes, with the suspicion again being that the recession is an excuse for, e.g., wage raise freezes, wage cuts, or increasing the employees' contribution percentage for (or lowering the benefits of) company health insurance, company retirement plans, and so on. It is very difficult to accurately detect, verify, or track the data that would be needed to test these hypotheses. Short of any outright auditing (which has no legally justifiable basis), firms have a fair amount of plausible deniability. As for the concern that productivity growth drives unemployment, the very idea is controversial, and it depends on whatever the true reality may be in the relationship of automation to unemployment. Certainly a pattern of multiple jobless recoveries, where GDP grows while employment stagnates, makes the public wonder about firms' assurances that all layoffs are necessitated by business conditions alone. ^ "Unemployment Spike – September 2008". Laidoffnation.com. Retrieved 2010-01-21. 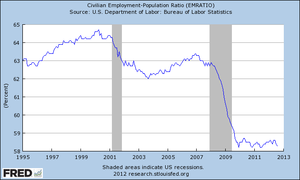 ^ "US unemployment rate eases to 10%". BBC News. 2009-12-04. Retrieved 2010-01-21. ^ a b Fox, Justin (2010-01-08). "Payroll employment down 85,000 in December, unemployment steady at 10% - The Curious Capitalist - TIME.com". Curiouscapitalist.blogs.time.com. Retrieved 2010-01-21. ^ "US sees 131,000 jobs lost in July". BBC News. 2010-08-06. ^ Lahart, Justin (2010-10-07). "Companies Shed Jobs Last Month, ADP Says". The Wall Street Journal. ^ Lahart, Justin (2010-10-09). "Job Losses Increase Pressure on Fed". The Wall Street Journal. ^ "Bureau of Labor Statistics"
^ a b c d e f g h i "Bureau of Labor Statistics"
^ "Employment Situation Summary". Bls.gov. 2010-01-08. Retrieved 2010-01-21. ^ "Massive job losses hit Canada, U.S - December 5, 2008". Canada.com. 2008-12-05. Archived from the original on 2012-11-09. Retrieved 2010-05-01. ^ "Canadian unemploymentr". Hrmguide.net. 2010-04-09. Retrieved 2010-05-01. ^ a b "Latest release from the Labour Force Survey - February 2010". Statcan.gc.ca. 2010-04-09. Retrieved 2010-05-01. ^ "Loonie soars on jobs report - March 12, 2010". News.ca.msn.com. 2010-03-12. Retrieved 2010-05-01. ^ Canadian, The (2010-04-09). "Jobless rate remains at 8.2%". News.ca.msn.com. Retrieved 2010-05-01. ^ Canadian, The (2010-05-31). "109000 fewer jobless people in Canada". Baystreet.money.ca.msn.com. Archived from the original on May 29, 2010. Retrieved 2010-05-31. ^ Canadian, The (2010-06-04). "25000 fewer jobless people in Canada". Economic Times India. Retrieved 2010-06-13. ^ Julian Beltrame THE CANADIAN PRESS (2009-06-03). "Experts predict bleak job numbers tomorrow". Toronto: thestar.com. Retrieved 2010-01-21. ^ "Is Canada still in recession or in mother of all jobless recoveries?". 2009. Archived from the original on November 11, 2009. Retrieved October 20, 2010. ^ Latest release from the Labour Force Survey. Statistics Canada. Accessed 2010-12-05. ^ "6202.0 – Labour Force, Australia, April 2009". Retrieved 2009-08-23. ^ "6202.0 - Labour Force, Australia, December 2009". Abs.gov.au. 2010-01-14. Retrieved 2010-01-21. ^ "6202.0 - Labour Force, Australia, August 2009". Abs.gov.au. Retrieved 2010-01-21. ^ "6202.0 - Labour Force, Australia, September 2009". Abs.gov.au. Retrieved 2010-01-21. ^ "(Page not found)". Archived from the original on July 6, 2011. Retrieved October 20, 2010. ^ "Pay rising as unemployment falls". BBC News. 2007-09-12. ^ "Unemployment increases by 137,000". BBC News. 2008-12-17. ^ "Unemployment passes two million". BBC News. 2009-03-18. ^ "UK jobless total at 12-year high". BBC News. 2009-06-17. ^ "UK unemployment increases to 2.5m". BBC News. 2010-04-21. ^ Hinted at by the many [informal/colloquial] online discussions found by web searches such as "using the recession as an excuse to lay off". This page was last edited on 27 January 2019, at 05:19 (UTC).